Which Picador Classic is for you? Why not take your next book recommendation from Martin Scorsese, Zadie Smith or Irvine Welsh? The Picador Classic series mines Picador's backlist of glimmering voices from the past and gives some of our favourite books a new lease of life. Each Picador Classic includes an introduction – a personal recommendation, if you will – from a well-known writer or public figure with a particular affection for the work. Why not take your next book recommendation from Martin Scorsese, Zadie Smith or Irvine Welsh? A modern day classic, Into the Wild is the story of a fearless young man who decided one day to leave everything he knew behind and set out into the unknown. At once a shocking and amazing exploration of the wild and a riveting look at what drives some of us to risk more than we can afford to lose. 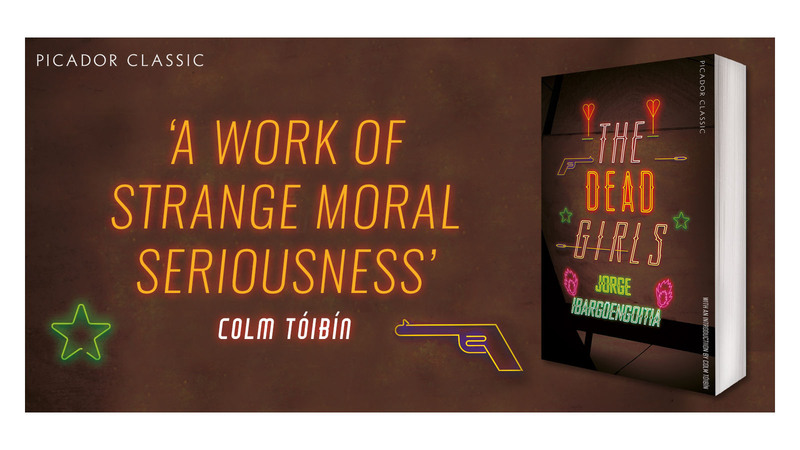 Inspired by true events, The Dead Girls is the story of the unexplained deaths of six young prostitutes, buried in the back yard of a small-town brothel in Mexico. The darkly funny novel cleverly uncovers the hopeless pedantry of a broken justice system, and the dark world of prostitution. Fran Ross's debut novel is a pioneering, dazzling satire about a biracial black girl from Philadelphia searching for her Jewish father in New York City. Woefully under-appreciated when it was first published, Oreo, is now considered a modern day masterpiece. The nation's favourite singleton is back! But this time, she's loved up . . . this is Helen Fielding's groundbreaking creation at her best - charming, loving and a little bit sloshed. A touchstone of the Picador list, Cormac McCarthy is a master story-teller. The Border Trilogy is an epic tale of two cowboys and dear friends in the Old West; an award-winning requiem for the American frontier. China Miéville's stunning, twisting and innovative thriller is like nothing else you've read before: genre-busting, heart-stopping brilliance. Shusaku Endo’s story of an idealistic Jesuit priest’s journey to Japan, and into the hands of those who would crush his faith, has been called one of the twentieth century’s finest novels. Silence is an astonishing exploration of faith and suffering. One of the most controversial and talked-about novels of all time, Bret Easton Ellis’ violent black comedy about a wealthy New Yorker leading a double life as a serial killer feels no less shocking and relevant a quarter of a century after it was first published. Alan Hollinghurst’s Man Booker Prize-winning masterpiece about class, politics and sexuality in Margaret Thatcher’s 1980s Britain. It is a novel that defines a decade, exploring with peerless style a young man’s collision with his own desires, and with a world he can never truly belong to. Acclaimed for their searing wit and their deep humanity, this magnificent cycle of novels - in which Patrick Melrose battles to survive the savageries of his childhood and lead a self-determined life - is one of the most important series of literary novels of our time. Bridget documents her struggles through the social minefield of her thirties and tries to weigh up the eternal question (Daniel Cleaver or Mark Darcy?). That saying? Behind every famous man . . . ? The wives of the great, the good, the not so good, and the legendary are given a voice in Carol Ann Duffy’s sparkling and inventive collection. A story of simple lives told with extraordinary empathy, Plainsong is an undeniable classic that explores the grace and hope of every human life and mankind’s infinity capacity for love. The death of legendary jazz trumpeter Joss Moody exposes an extraordinary secret. Unbeknown to all but his wife, Joss was a woman living as a man. A beautiful modern classic about the lengths to which people will go for love. A unique love story and a classic work of philosophy, Alain de Botton uncovers the mysteries of the human heart. An iconic book - one that should be read by anyone who has ever fallen in love. Elizabeth Jane Howard’s uncannily authentic portrait of a very middle-class marriage traces the lives of Antonia and Conrad Fleming through the eyes of Antonia, as she looks back on her married life and unravels her choices - good and bad - and the motivations behind them. In heaven, Susie Salmon can have whatever she wishes for – except what she most wants, which is to be back with the people she loved on earth. An astonishing novel about life and death, memory and forgetting, and finding light in the darkest places. Nicholas Coughlan and Isabel Gore are meant for each other – they just don’t know it yet. Though each has found both heartache and joy, their paths are yet to cross. A classic love story, seminal work of Irish literature and a testament to romance, magic and the power of true love. Perhaps Pym’s finest work, Quartet in Autumn follows the lives of Edwin, Norman, Letty and Marcia who work in the same office in 1970s London and suffer the same problem - loneliness. After crash-landing in the Sahara Desert, a pilot encounters a little prince who is visiting Earth from his own planet. Their strange and moving meeting illuminates for the aviator many of life’s universal truths, as he comes to learn what it means to be human from a child who is not. In his most extraordinary book, Oliver Sacks recounts the stories of patients with inexplicable and often inescapable neurological disorders. A classic work of psychology and a fascinating exploration of the mysteries of the human mind. Mary Karr grew up in a swampy East Texas refinery town in a volatile and defiantly loving family. In this funny, devastating, haunting memoir Karr paints a harsh world redeemed by her warmth, intelligent humour and finely spun prose.